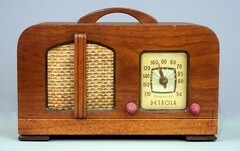 Detrola (International Detrola Corp) was a radio and record-player manufacturer, based at 1501 Beard Street, Detroit, Michigan. They used the names Detrola, General, Pee Wee, Road Chief, Road Master and Warwick for their electronic products. 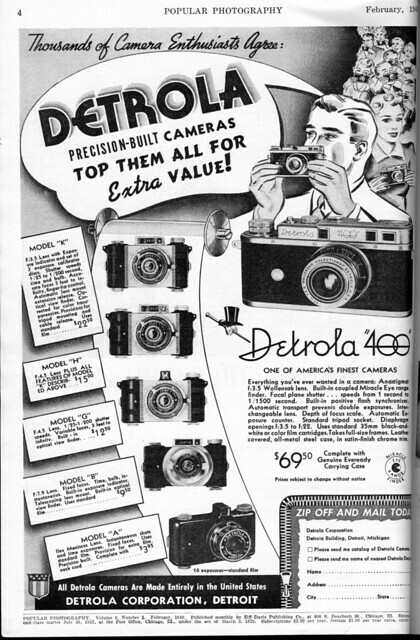 They also made a few cameras, over a very short period - 1939-40. Most were cheaply-made from Bakelite mouldings and pressed tinplate, but the Detrola 400 was a complex Leica-style rangefinder affair. The "W" models listed below are equipped with lenses by Wollensak; but not all the Wollensak-lensed cameras carry a "W" model designation. This page was last edited on 20 March 2015, at 18:39.